How do I take my mattress out of the box? When can I sleep on it? 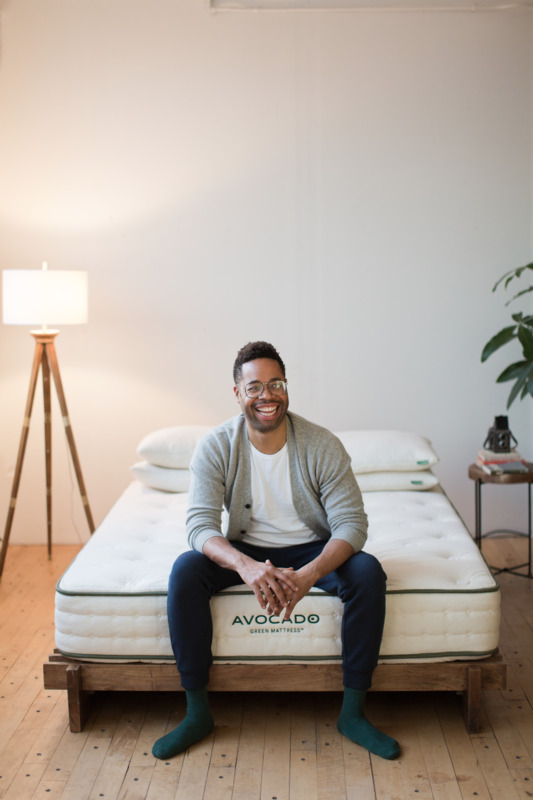 Opening and unboxing your new Avocado Green Mattress is easy. Move the box to the room where your new mattress will ultimately be placed. Because we use natural materials (which weigh more than polyurethane foams), you may be surprised by how heavy your new mattress is. When moving it, especially the larger sizes, the work is best done by two people. Open the brown shipping box at the top or bottom, within two weeks of receiving your mattress. Your mattress will be sealed inside within two layers of plastic. Slide the mattress out of the box, by laying the box on its side. Carefully cut the outer white layer of plastic only, and remove it from the mattress. The mattress will still be sealed within a second layer of plastic. Do not cut both layers of plastic at the same time, or the mattress will immediately begin to expand while rolled. Unroll the mattress and position it — either on the floor or on your bed frame — in a spot where it has ample room for it to expand to full size. Finally, carefully cut the remaining clear layer of plastic and remove it from the mattress. The mattress will fill to full size rather quickly (but not in any dangerous or alarming way). Call in friends and family members, as this is especially fun to watch. Within 30 minutes, you can lay on your new mattress. Within a few hours, your mattress will be fully expanded. To be green, we use brown shipping boxes with minimal branding. The money we save on printing and producing boxes helps us to fund our charitable and giving initiatives to nonprofits within 1% For the Planet®. We encourage you to read about them on our website. All mattresses are sent compressed — for both FedEx delivery and our optional in-home delivery & setup service. We have found it keeps them safer during transport, and makes it far easier to move them up stairs and around corners (without marking walls) while they are still compressed. Any wrinkles will disappear within a few days. Because we do not use polyurethane foam, the corners may be the last areas of the mattress to fully decompress. If you prefer to hasten the process, you can simply lift each corner and give it a little shake, while holding the top edge. Some customers may experience a soft, sweet, vanilla-like smell after opening their mattress. It will disappear. This is a result of the organic materials used (latex, wool and cotton), which have been vacuum-sealed within the plastic just after the mattress was made. It is not harmful in any way.